The internet has caused a total shift in the way many people shop and search for the information they need. It is vital for any size business to have an online presence to stay competitive within its industry. Maintaining a good website is one of the best ways to promote a business. It lets you Tell Customer Who and Where You Are. You can Reach All Corners of the World without spending much. You can let your customers communicate instantly with you which is very good for your business. Return-on-investment is higher than other advertising channels in most cases. Upcoming sales and new products can be instantly advertised on the business website. Having an active website is important even for small, local businesses. But is it that any website works good.? There are many pitfalls, confusing points to adhere to when it is about choosing the right platform to create your website. You can get started for free in 30 seconds. Dynamic site which loads fast, design that looks good and feels native on any of your customer’s device is what we guarantee. Updating site yourself is easy and it evolves with your business, handling lifetime of data. Promoting any updates, discounts instantly is an easy go. Can cost you very little maintenance. You can least bother to have a technical team. No more downtime, No error no more technical issues. You're in control of your site, so you will not be charged unnecessarily. No complications to lock you in. 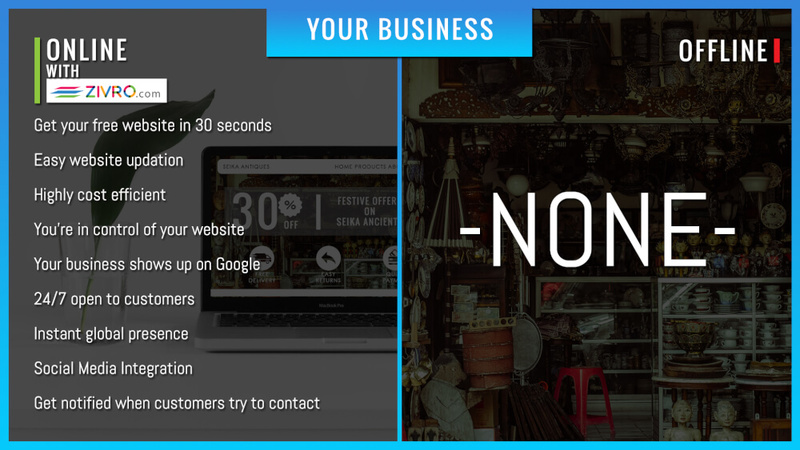 Gets your business found on google and you can start selling online instantly. People can shop on your website around-the-clock where otherwise they may not have even known the business existed. Reach right people anytime without fail. Instant global presence which allows your business to capture customers from around the world using our efficient lead capture system that notifies you whenever this event occurs. Your website content can be integrated with your social media profiles with just a click to increase engagement which leads to more and more sales. Your customers gets access to ask a question, or notify you about a problem with your goods or services. You will get an instant notification. This gives you the ability to provide instant feedback to the customer and improve your customer service satisfaction rate.